This image of the 17 km long and 10 km wide asteroid was taken by the Galileo spacecraft as it flew by the asteroid Gaspra (951 Gaspra) on October 29, 1991. 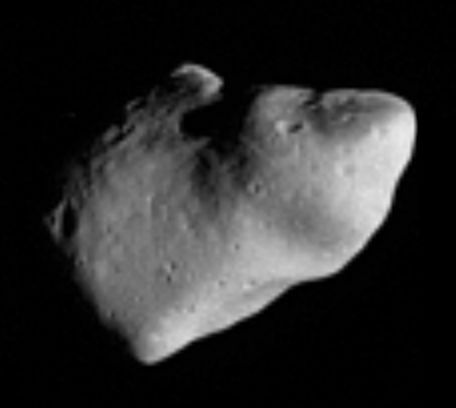 Gaspra resides near the inner edge of the asteroid belt and has a 7 hour rotation period. This picture is believed to have been taken at a range of 16,000 kilometers (10,000 miles) using Galileo’s solid-state imaging camera. Galileo’s encounter with Gaspra marked the first instance of an asteroid being (so) closely examined by a spacecraft.